One in four men cheat. But what if their betrayal is inevitable? What if, the women are cursed? Cursed by a 500-year-old love lock. If you were the one in four, would you try to break the curse? Mara doesn’t believe in curses. She believes in facts: the women in her family are the one in four just like 800 million other women in the world. Until one night of tragedy changes everything and Mara must confront the Cornuta Curse, the curse that’s doomed the women in her family to generations of betrayal, whether she believes in it or not. Armed with an heirloom key and a fireside tale of a botched up love pact, Mara arrives in the medieval villages that are set among the Cinque Terre on the Italian Riviera in Italy. Colourful tower houses nestled into cliffs that plunge down into the glistening sea: at first glance it is a tourism mecca of spectacular beauty. However, within moments Mara is lost in the folds of an old world village, where a dark history of pirates, murder and betrayal still reigns – her curse at the root of it all. On meeting Saro, part time barman, part time pirate, Mara starts to believe in the verity of her curse and the possibility of true love. But as the curse promises wealth, love and even life to all involved, will Saro help her solve the puzzle of the Cornuta Curse, or will he kill to keep it alive? 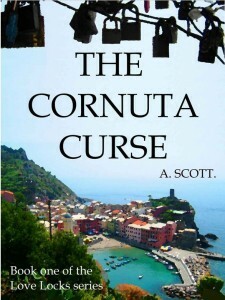 Recently recognized as an Amazon Breakthrough Novel Award Contest 2014 – Round One Winner, The Cornuta Curse is available as a free Kindle download from Amazon from Thursday 17 April to Monday 21 April. As of this writing, the book has an average of 4.5 out of 5 stars from 2 reviewers. For more free eBooks, check out our 10 Websites to Download Free eBooks list, as well as our Free eBook of the Day archive.